In the past months I have been rather quiet, the reason is that I have dealt intensely with Scrum, an agile management framework. I have been a follower of agile practices in software development, for example XP, and Scrum extends these practices to a larger context. 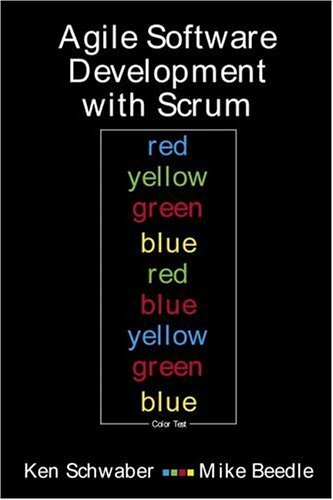 This book is a good introduction to Scrum, as it is written by some of the creators of Scrum, and therefore an original, one of the first to deal with the subject, and furthermore it is very concise, it only weighs about 150 pages. Scrum has worked extremely well in my (still limited) experience. The most promising aspect is, that people seem to love it. That's one of Scrum's central aspects, it puts people first, just like the Agile Manifesto demands, "Individuals and interactions over processes and tools". With a very small set of strict rules, it takes a lot of the burden of decision making off people and lets them focus on their work. 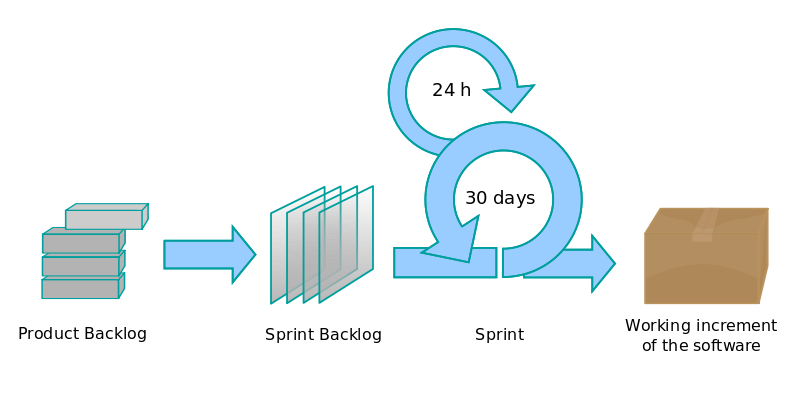 Wikipedia has a great article on Scrum, explaining it in much greater detail than I could in a blog post. But the following illustration sums it up quite nicely I think. What I want to do is to give you a few more interesting stops for your Scrum journey. First of all, a good companion to the book by Schwaber and Beedle is "Scrum and XP from the Trenches" by Henrik Kniberg. The author shares his experience with introducing Scrum at his company of about 40 people. He describes his solutions to the problems he faced, which I found useful in the first sprints I took part. Also a very light weight book, good content but an easy read. Kniberg's company also sells Planning Poker decks at reasonable prices. There are some excellent lectures on YouTube's GoogleTechTalks channel, like "Scrum Et Al." by Ken Schwaber, or "Self-Organization: The Secret Sauce for Improving your Scrum team" by Scrum co-creator Jeff Sutherland. I find the latter one even more impressive as Sutherland portraits what can be achieved with Scrum if you manage to get a team into hyper-productive state. At Jeff Sutherland's blog you will also find the Nokia Test, developed by Bas Vodde at said company in 2005 in order to measure how true the implementation of Scrum was to the original concept. You have a set of nine questions, and after a product cycle has completed, each team member is supposed to answer this catalog. From the answers you can compute a number, which indicates the degree to which you have stuck to Scrum. I found this test very useful in a Sprint retrospective I led. The books by Mike Cohn might also be worth a mention, despite the fact that I haven't read them. I have only taken a glance at "Agile Estimating and Planning", which seems to take a more academic approach, but also his other two books seem to be interesting, "User Stories Applied" and "Succeeding with Agile". His blog is also always worth to subscribe to. Last but not least, I want to mention the mailing list scrumdevelopment at Yahoo, which is a good reality check as you can read about the challenges people face when introducing Scrum to their environments.